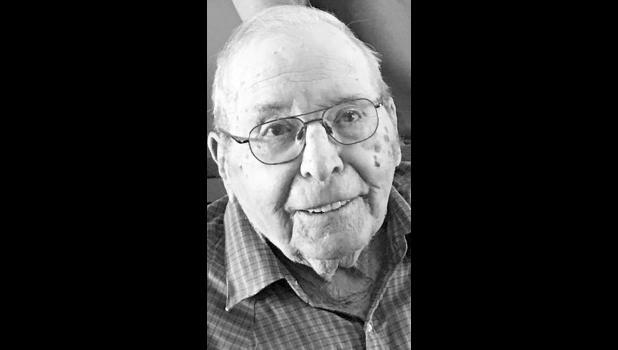 Edward Karns Pfrang, 98, Oneida, died Friday, June 22, 2018, at Stormont-Vail Hospital in Topeka. Edward was born Jan. 6, 1920, on a farm near Ontario, Kan., the son of Fred and Carrie (Karns) Pfrang. He graduated from Bancroft High School. He was in the Army during World War II and served with the 400th Coast Artillery Battalion from 1942-1945, for 39 months, including stays in North Africa, Sicily, Italy, Corsica, France and Belgium. On Feb. 9, 1949, Edward married Eldred Lela Zwahl, whom he met after receiving letters from her during the war. They made their home south of Oneida until moving to Medicalodges in Holton in March 2018. Edward was a livestock man and farmer all his life. He was a Director at the First National Bank in Goff for many years. Edward and Eldred have three children: Judy (Ken) Georg, David (Ginny) Pfrang and Gary (Susan) Pfrang: nine grandchildren, Aaron (Michelle) Georg, Darin (Kara) Georg, Shawn Georg, Nicole Pfrang, Keri Pfrang, Alena Pfrang, Derek (Jessica) Pfrang, Kehley Pfrang and Corbin Pfrang; and seven great-grandchildren. Ed loved to farm, raise cattle and tell stories, and he had immense love and pride of his family. He continued to be involved with farming — and even last fall he could often be found riding in trucks, tractors or combines, sharing his love of farming with his family. He was preceded in death by his parents, Fred and Carrie Pfrang; a brother, Lloyd Pfrang; and a sister, Anna Pfrang. Funeral services will be held at 11 a.m. Thursday, June 28 at the Popkess Mortuary Chapel in Sabetha. A visitation will be held from 10 a.m. until service time at the funeral home. Interment will be held in Wetmore Cemetery with military honors.